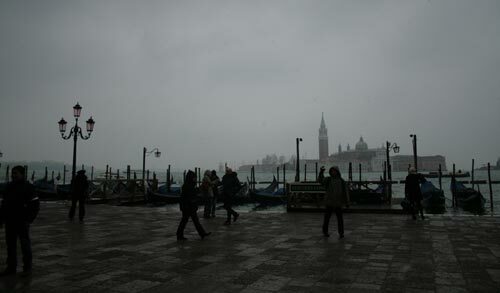 The snowstorm was the last and least expected guest to arrive at the carnival in Venice. It started shyly in the morning the day before Mardi Gras. A few drops of rain and an almost intangible chill. Nothing you wouldn’t expect in February. Nothing scary. Well, the preparation for Acqua Alta – the high water – may have been a little worrisome. Whenever people expect rain or snow in Venice they get ready for the inevitable rising of the canals. They pull up the metal barriers in front of their doors, put on high rubber boots and then return to their daily business – after all, it is just water and they are quite used to it. Around noon things became worse. The rain turned into snow and the wind became chillier. The masked crowd had left the San Marco square almost surreally empty, the piles of wet confetti being the only sign of the interrupted carnival. What can you do during the carnival when everything happens in the street, if the street is more of an abandoned ski track? Go inside. Have a strong coffee in a crowded coffee shop, standing beside the bar like the Italians do and then go see one of the famous palazzos of Venice. I chose the one nearest to my hotel – Ca’ Rezzonico. A former residence of a wealthy family, it is now a museum of Venetian art. Three floors of art, to be precise. Worth seeing, undoubtedly, but not as much as a humble little window on the third floor. It was just a window. A narrow one, overlooking the Grand Canal, now blurred by the blizzard. On the other side of the glass the wind was doing a crazy tango with the snow, tossing the snowflakes in all imaginable directions. It was like looking into a snow ball, with the canal far below and the shadows of the buildings blurred along its banks. It was a magical moment, maybe even more so because I was in a magical town built over water, defying logic and convention. And also because, from below the roof of this centuries-old palazzo, I was witnessing something you don’t get to see every day – a snow blizzard over the usually sun-drenched, Hollywood-favourite Grand Canal. The next day, Mardi Gras, I almost missed the storm. The sun returned with all the glory befitting the final day of the carnival and the snow melted quickly like a woman’s whim. The beautifully inconvenient storm had been a brief, unique moment, caught by chance through an old palazzo window, a moment which had been even more precious because of the discomfort of the cold winter day and of my wet feet.